Have you ever seen something like this ? I just came across with this pic while I was searching on Bromelia pic. It was taken somewhere in Brazil, I wonder if it's a bromeliad or not ? Here the link to the photographer who has a really great port folio. this spec. can not be a bromelia because there are 2 Spikes on same place on the leave. maybe it is some sort of Yucca or Dasylirion ? that this mysterious plant should be a species of Eryngium (Umbelliferae = Apiaceae), a dicot plant. because I prefer to die for to get one of that kind of spikey! Funny, when I was in Chile for the first time I got fooled as well. That time by Eryngium agavifolium, which is very common and sometimes really bromeliad-like. 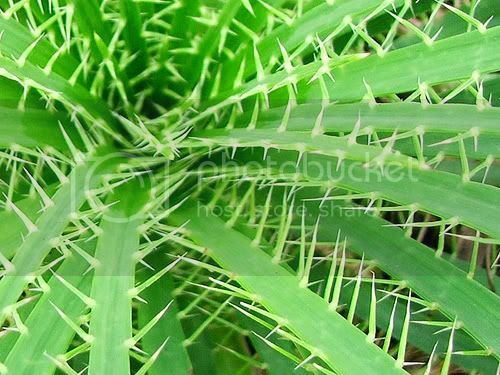 Nice plants, but very unfriendly spines.